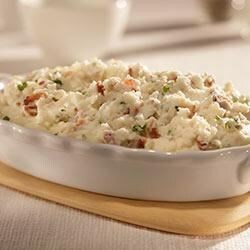 "Red and Blue Mashed Potatoes is a great recipe for the blue cheese lovers-use our Baby Reds® Flavored mashed potatoes, then simply add bacon and blue cheese. Easy, quick and delicious!" Follow package directions and prepare mashed potatoes.